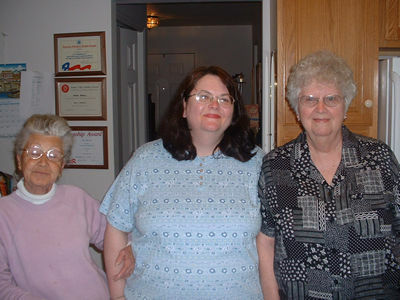 Meet my posse - my mother and Aunt Phyllis. Yeah - that's right! This is how I roll! These "playas" are never a dull moment. They've raised bickering to an art form. Whether we are eating dinner, sitting in a doctor's office, driving, or shopping, the arguing never ceases. If squabbling were an Olympic event, they would be the Torvill and Dean. 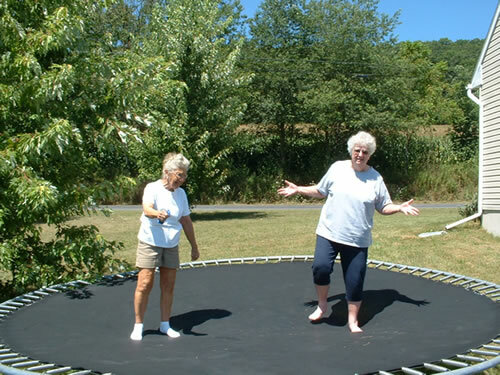 We in the family take pride in this skill and always tell newcomers, wait 'til you meet my Aunt Phyllis. What do they argue about? EVERYTHING! The shape of a cloud, where Phyllis bought a purse, the color of a sweater, who got more time on the bicycle they shared as kids, whether Phyllis is following her doctor's orders, and on, and on. But they are devoted to each other. Mom can criticize her sister, but don't you try it! She will set you straight in a heartbeat. 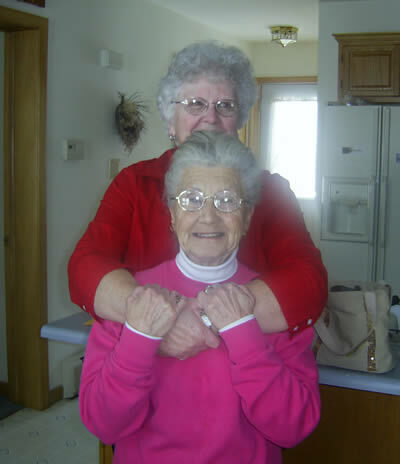 They are the last of ten siblings and have been driving each other crazy for nearly eighty years. Not only have they survived the loss of their parents and eight siblings, but tragically Phyllis's two sons died young. Yet they keep smiling and going strong. Aunt Phyllis does have a few quirks. She lacks compunction, and once asked a family to trade us restaurant booths. She tends to dawdle in stores and disappear out of our sight, which quite irritates my mother. She knows no modesty. Once I walked in her front door, and she appeared at the top of the stairs, stark naked, growling "who's there?" Every summer day found her laying out in her bikini, drenched in baby oil and iodine. This continued well into her senior years and caused great embarrassment to my daughter when she was dropped off after school. There Phyllis would be in her bikini for everyone on the bus to see! So, this is who I hang with. We're headed for Danville tomorrow, eighty minutes each way. Fasten your seat belts and let's posse up! Still up for anything in 2006. 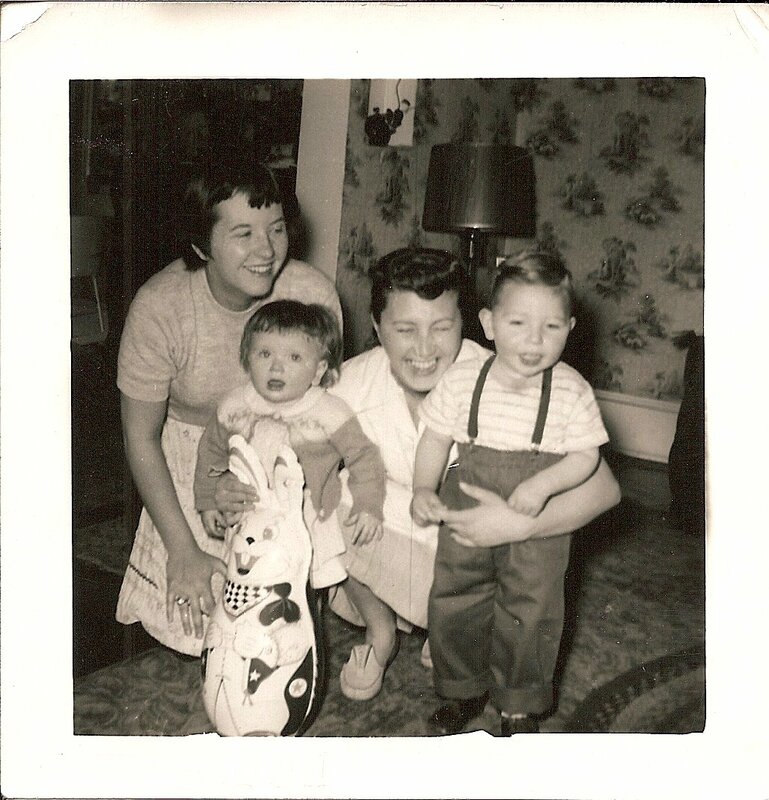 Mom and Phyllis with their first-borns circa 1955.